Go behind the scenes of Janet Echelman’s soaring fiber sculptures. Fans of nature and screen-printed poster design will love this series. Watch Debbie Millman interview graphic design legend Milton Glaser. We interviewed art directors at top publications and asked them how they choose and work with illustrators. Bruno Sellés shares his five favorite designs. Do you agree with the choices? Designers Timothy Goodman and Jessica Walsh developed a 12-step process for becoming kinder, more empathetic people. Annie Atkins designs props and illustrations for movies and TV shows, including Wes Anderson’s “The Grand Budapest Hotel.” Take a look inside her secret world. We chose three of Taiyo Yamamoto’s album cover projects, for their mysterious abstract quality. Do you agree with his picks for the best designs? What would you choose? Innovative directors are using technology to enliven traditional art forms. 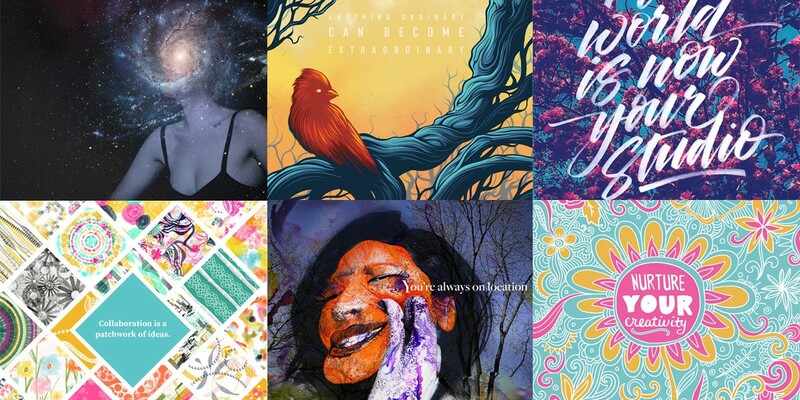 See how six artists Make It on Mobile, turning a creative mantra into a finished poster. Sit down with this successful artist and mentor. A brainchild of actor Joseph Gordon-Levitt, this website fosters creativity and enables collaboration among artists from around the world. With props, models, makeup, and costumes, Lori Pond staged life-sized recreations of tiny details from Bosch's fantastical paintings. Limahl Asmall of House Originals breaks the rules with the word "rebellious" for the WTFIT challenge. Designer and letterer Louise Fili talks inspiration, process, and how to tactfully handle clients who want things their own ways. With their strong graphics and Pop sensibility, Juco’s photos are more refreshing than a drink of ice-cold water. See magazine art director Rebecca Chew’s unusual hands-on techniques. In works like “The Refugee Project,” Ijeoma is exploring ways of connecting people, data, and social issues. This Italian agency creates delicious packaging the old-fashioned way. Do you agree with the award-winning designer’s choices for best designs? Font fans, enjoy this interview with Bruno Sellés about his type design process. Students at Budapest’s Moholy-Nagy University of Art and Design completed projects based on a philosophy of their university’s namesake, Lázsló Moholy-Nagy. Jerico divides his time between the Canary Islands and the island of Cebu, in the Philippines. But his artwork is truly out of this world! Meet the creative duo behind some of the most beautiful, intricate, and colorful window displays and installations we’ve ever seen—in slightly fewer than six questions. Inspiring designer, artist, and writer Elle Luna has an amazing story filled with dreams, art, nature, and voices from above. Self-taught Seattle-based artist Mark Kirkpatrick has found a growing and appreciative audience for his work online—including making his work available for purchase on Adobe Stock.